Well pumps are most commonly used to bring potable water up from wells and springs to the surface. Collectively, well pumps include a number of other pump types, such as jet pumps, submersible pumps, mud pumps, and bladder pumps. Well pumps may be used for other applications beyond well water collection, such as unloading barges, small tankers or storage tanks, and may include pumping other media besides water, such as oil or natural gas; or less commonly chemicals and petrochemicals, hazardous materials, slurries (especially ash slurries) and wastewater. While they are most at home in water distribution services (municipal and agricultural) and mining or other fuel production applications, they are sometimes found in construction and commercial service industries. Water well pumps are roughly divided into two styles, shallow well pumps and deep well pumps. Shallow well pumps are generally located above ground to lift water out of the ground through a suction pipe. The typical lift limit for such a pump is 33.9 feet, at sea level, although some shallow well jet pumps may be able to provide greater lift. Deep well pumps are submersible water well pumps that are used to force water upward from a pumping element below the water level. They are not restricted by suction lift limitations. Non-water well pumps include well stimulation pumps, which are typically used to rejuvenate old, or poorly producing wells. They are typically used in oil and fuel production and are similar to deep well water pumps in specification. Well pumps may be actuated by a wide variety of power sources. These include AC or DC power sources, pneumatic or hydraulic power, fuel powered engines (gas or diesel) manual power (hand well pumps), and solar well pumps. Borehole pumps to be installed into wells. These can either be inclined or vertical wells. A borehole pump is a fully sealed unit. It can be fully submerged or operate in an atmosphere of potentially explosive gases. Borehole pumps range in size from a few cubic meters per hour, with as little as five meters hydraulic head, to many hundreds of cubic meters per hour with hydraulic heads ranging up to several hundred meters. Borehole pumps are employed where water in a site is free draining to a single point within the site and an extraction flow rate of above a few cubic meters per hour is required. When determining a pump for an application, there are a number of factors to consider. Among them are flow requirements, head conditions, and suction requirements. The success of your project is going to be determined mainly with your pump choice. If you have a specific need (sumping a lake, wellpointing a construction excavation, sewage bypass pumping), then selecting the right pump will make the project a successful one. Select the wrong pump, and the project will face additional challenges. unless there is past experience. In highly critical projects, it is better to contact specialty contractors who typically use, and are more familiar with, all types of pumps in the everyday field operations. Q: I need a pump to handle water laden with trash, sludge, or other debris? A: The 6″ jet pump and the 6″ wellpoint pump will clog from debris and trash, which will result in accelerated wear or reduced performance. 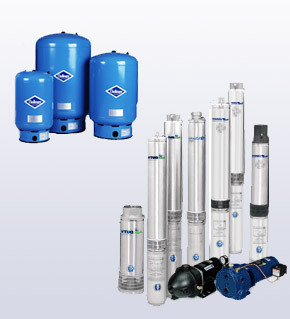 The 6″ trash pump, 6″ non-clog pump, or 6″ hydraulic submersible pumps are the pumps you need. Q: I need a pump with over 300 feet of head? A: The 6″ trash pump, 6″ hydraulic submersible pump, 6″ non-clog pump, and 6″ wellpoint pump will fail to push the water that high. The 6″ high pressure (jet) pump is the pump you need. Q: I need a pump that can remove large quantities of air along with the water? A: The air may cause both the 6″ trash pump and 6″ jet pump to stop pumping. The high air-handling capacity of the wellpoint pump or non-clog pump make them the correct pumps for this application. Q: I need a pump to pump out a lake, where the final depth of the lake will be 50 feet. Which pump should I use? A: While above ground pumps can be used initially, the suction limitation of all above ground pumps is approximately 28 feet, so the pump would be to moved down as the lake was being emptied. A better choice would be a hydraulic submersible pump as this could be set at the bottom without the need to relocate. Q: I have a sewer bypass with a long suction line and need the pump to prime with minimal priming time. There is no space for submersible pumps, so I have to use an above ground pump. What pump should I use to minimize the priming time, as the pumping reaction time is limited, and we cannot have a sewage spill? A: Use a non-clog pump or trash pump with a vacuum unit as the priming device. Typically all dry priming pumps, which are pumps that do not need water in the pump volute for priming, use either a compressor/venturi priming device, diaphragm priming device, or vacuum unit. The vacuum unit is the fastest prime due to its air handling capacity. Q: Why is there such a price difference between pumps? After all, aren’t all pumps basically the same? A: There is a vast difference between pumps. While the intake and outlet of the pumps may appear the same, the flow capacity, and head characteristics can vary greatly between manufactures and models. These, along with the construction materials and accessories make the difference between an adequate pump and a well built pump. All of the above are 6″ inch pumps, but all are very different from each other and are designed for different types of jobs. When selecting the right pump, don’t go to the nearest salesperson and tell them you need a 6 inch pump, tell them what you need the pump to accomplish. A salesman may give you what he has in stock or on the shelf; however, a professional will evaluate your application and give you the right tool.